I am an avid hobby juggler. 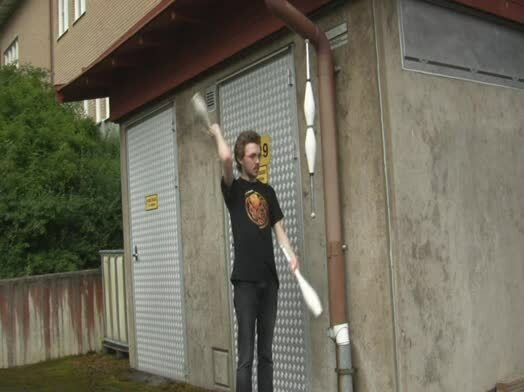 My newest stunt: Magnet-pimped juggling clubs that allow for totally new juggling acts. Note from the supermagnete team: The following video is abbreviated. Here you can view the original video from Ameron. The magnets on the front part of the club are disc magnets 12 x 6 mm and the ones on the handle are disc magnets 15 x 8 mm. You can see the magnets well on the picture, but when I'm juggling I cover them with a thin tape so they don't scratch or chip. I used these pimped clubs in a workshop I did at the University of Dance and Circus (DOCH) in Stockholm, which was a huge success. Several students and alumni made their own magnetic clubs for their performances. I hope that magnetic juggling will turn into a new trend among hobby jugglers. We experimented with other magnet types, but in the end these two sizes worked the best. A note about arranging the magnets: In my video I always placed the same pole facing outwards on a club, meaning the north pole on one club and the south pole on another. This way, you can combine the clubs in various ways, but you always have to remember which club is which. This calls for some advance planning before doing the tricks, but it makes it more interesting. The DOCH students placed the magnets in a way that the north pole faces outwards on the handle and the south pole on the front. This has the advantage that every club does the same thing, so during juggling you don't have to think about which club has its pole where. On the other hand, these clubs can only be combined in one way: Handle of the one club on the front part of the other.